The journey from Paris, situated in France and London, which is in England is well connected by trains. The trains are run by the following rail operators: TGV, Eurostar. Using the train is a fast and convenient way to get to London from Paris. 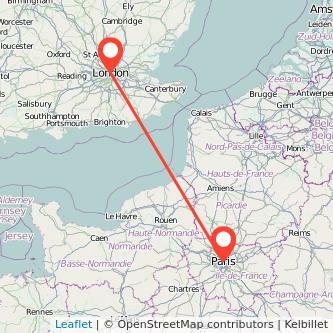 The average journey duration between Paris to London is 2h23m to travel the 214 miles. We found trains from £49.50 to travel in the next 30 days. Fares can change depending on when you travel or how long in advance you buy your ticket. Find the cheapest tickets to travel from Paris to London by train, bus, ride sharing and plane. According to our data, 15 trains from Paris to London are running today and 15 tomorrow. The first Paris London train is at 08:07 and the last one is at 21:03. The first and last departure times may be different on each day of the week and there may be fewer services during weekends or public holidays. Rail operators may also increase or decrease the number of trains during school holidays or depending on the season. The Prices for train tickets Paris to London will increase the closer you get to your departure day. If we look at our data, if you book your seat 2 months in advance, tickets should be available from £59 whereas when buying your ticket on the day you're travelling, you will need to spend at least £172 for your journey. Thus, you can save 66% on the price of your ticket by purchasing your seat 2 months in advance rather than on the day you're travelling. We compare train ticket for all major companies to travel between Paris and London by train and find the best prices for the coming days. Take a look at the prices of train tickets London to Paris and find the best deal for your outbound journey.